Tanit is the great Phoencian goddess of Carthage, consort of Ba’al-Hammon. As a deity, Tanit embodies all things traditionally associated with the feminine. She is considered a lunar goddess, as well as motherhood and fertility. Tanit watched over the city of Carthage, and the people there built numerous temples in her honor. The people also created a symbol to represent her, something uniquely hers, a triangle with a circle at the top with a horizontal line between the two. Often the horizontal line has smaller up turned lines at the end. Many believe this to be a woman, or goddess, in a long dress with her arms upraised in worship or blessing. Of course, others feel this symbol represents an altar. You know, the triangle is the base, with the line being the altar top, and then the circle would be the sacrifice. That’s where the trouble begins. Many say the circle represents a baby. Historians have been debating about whether the citizens of Carthage sacrificed babies for a very long time and I am absolutely not going to be able to answer that question for you…. Oh, you’re still reading? Good for you! Here’s the deal, when they excavated the burial grounds of Carthage they found hundreds of urns, many of these urns were inscribed to Tanit or Ba’al (the hubby, remember?) and contained the remains of infants. Obviously there are arguments for both points of view; some point out that young lambs received the same burial treatment as the infants, that older children and adults were buried in a separate place, of course they also mention that many cultures buried children separate from adults. The list of yes they dids and no they didn’ts goes on and on. You know what I have to say to all this? I don’t care. You heard me, I don’t care! 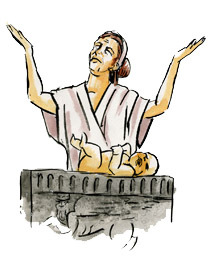 I’m not saying that I’m pro baby sacrifice, what I’m saying is that it’s not happening now, so why let it be an issue when contemplating Tanit? The true horror of Tanit isn’t the potential of infants being sacrificed to her, it’s the fact that it’s hard to find anything besides that about her! Here is Tanit, THE goddess of Carthage, and I can’t learn anything about her because everyone wants to talk baby slaughter. Even if people did sacrifice children to her, I’m sure there’s more to her than that. Hopefully one day I’ll get to learn what it was about this goddess that inspired the love of all of Carthage.